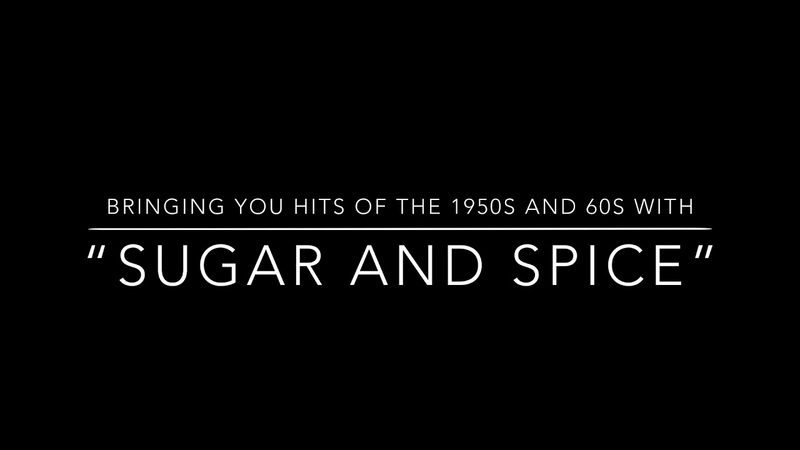 “Sugar and Spice” -The Vintage Dreams 1950s/60s Revue! Jazz Crooner Val Williams Sings "My Favorite Things"
1920s Jazz Look. Jazz Singers and Musicians Available! 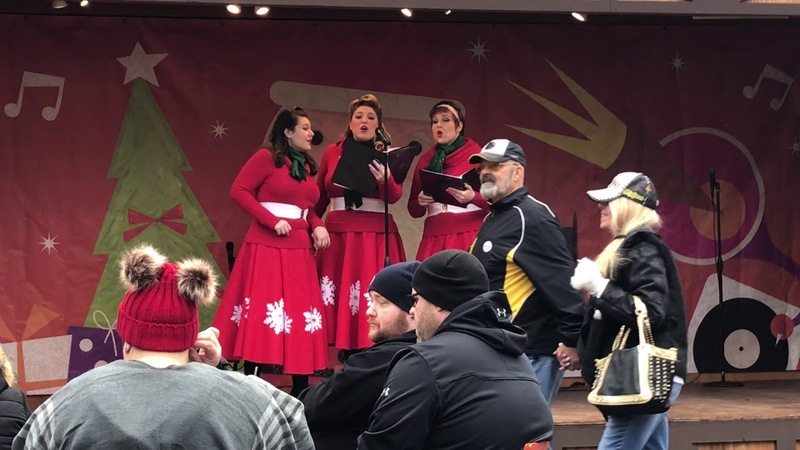 Songs For Young Whippersnappers get ready to "Holiday Hoopla" in Pittsburgh, PA! Songs For Young Whippersnappers-Holiday Edition! Songs For Young Whippersnappers Halloween Show with the "Purple People Eater"! Actors at #SXSW in Austin TX! Vintageous Dancers getting the party started in NY, NY for a 1950s themed event! Congratulating our winner of the Sock Hop Dance Off with our Dance Instructor in Austin, TX! Country Line Dance Instruction, Montgomery, TX! Enjoying a little Two Step learned from our Line Dance Instructor! The Vintage Dreams entertaining in Houston, TX! Austin, TX Entertainment Company Offering Musical Entertainment for events of all kinds. Available year round for: Festivals, Birthdays, Weddings, Cocktail Parties, Festivals--name your special event, we can make it Vintageous! Available Nationwide & International bookings. Travel fees apply outside of the greater Austin, TX & surrounding areas . 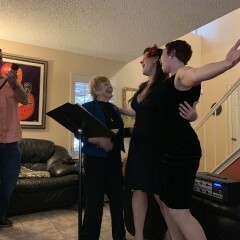 Wonderful group that performed Broadway tunes for my mom’s 80th birthday. She was absolutely delighted, and so were all the guests. Thanks for a great show! 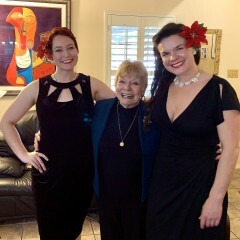 We had Leslie McDonel perform at our small office Christmas party and she was amazing. We had a quirky party setup and she completely rolled with it, sounded awesome and got everyone into the spirit! Highly recommended. Thanks so much Chris! We are so glad we could help to make your event shine! It was a pleasure to work with you! Perfect for out intimate company event, great voices! Noel and Matt performed at our Resident Holiday Party on December 19th and the evening it was absolutely magical. Both performed arrived on time, were dressed beautifully, set up their equipment in the designated area and were ready to go in just a few minutes. I requested to take some pictures of them and they were happy to do so. Both Noel and Matt were so kind and professional which for me is very important. But most importantly they music was amazing. Noels voice is beautiful, she is like an angel when she sings and Matts guitar complemented her voice beautifully. If you have an event coming up where you need live musicians I couldn't recommend Vintageous productions enough. The entire process was easy and seamless from booking to event. Go with Vintageous as you will not regret it! Thank you for the kind words and compliments Nathalie! We loved working with you and can’t wait to collaborate again! The carolers were fantastic. They were well prepared and customized a sing a-long for our party goers. They were really pleasant to work with and I wouldn't hesitate to work with them again. Val, Noel, Elisa, & Leslie! I hired the group to sing vintage style Christmas carols at our office holiday party. They were prompt, professional, polite, and most of all Fun. Everyone here loved it! I would definitely hire again. These girls did a FANTASTIC job. This was a typical breakfast corporate event. What could have been an uneventful became a fun and interactive experience. With a creppy carnival theme, we asked for our actresses to come as Elvira and as a fortune teller. They took our branding information and incorporated it into their characters and delivered our branding seamlessly. While being fun and engaging, they approached our guests in a professional but fun way and got them to participate and interact. Without hesitation, I would hire them again and give them a glowing recommendation. Val is a true professional!! It was a blast ! Thanks so much Sharon!! We loved working with you too! Vintageous was great! Valerie's voice is beautiful and she is HILARIOUS! felt like we stepped back in time and especially my parents loved it. (We hired them for my parents 50th wedding anniversary...but everyone had a blast!). We had a DJ for after dinner but people were up and dancing to Vintageous before dinner even ended! And they were super nice. Would definitely hire again. Thanks so much Amy! We had a blast ! Happy Anniversary to Debbie and Sal! I saw Vintageous perform at Toshi's Living Room in Manhattan and knew I had to book them for my birthday party! Valerie's voice is perfectly suited for the sultry & romantic music she sings, and the music is all beautifully arranged and performed. My friends all LOVED the music, the sassy banter, and the classy, vintage look. It was a perfect way to ring in my 30s. I couldn't be happier with the booking, and highly recommend Vintageous to anyone. Thanks Noelle! It was such a pleasure celebrating with you! Performances can range from a few songs to a full day or evening (up to 3 hours of music) based on your request! Songs For Young Whippersnappers: Music and Fun for the whole family! 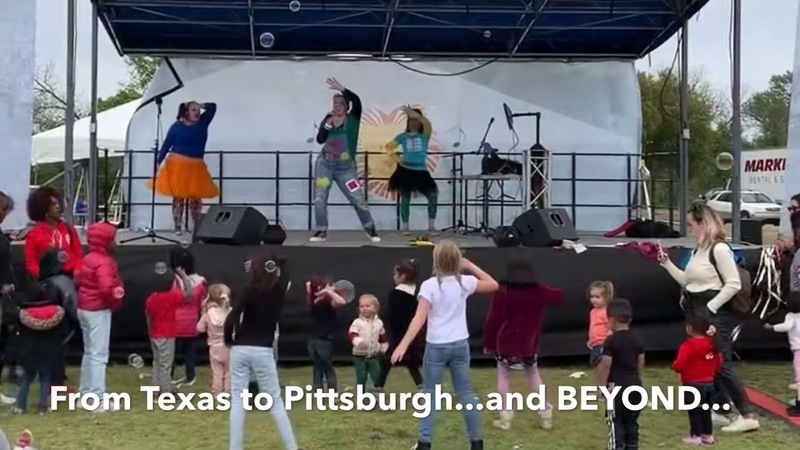 Singing, Dancing, Bubbles and more-perfect for your family-friendly event! Vintage Dreams: Holiday Harmonies in a Vintage Style! The music of Bing Crosby, Rosemary Clooney, The Drifters, and more comes alive with this holiday A Cappella Trio! Vintageous Jazz: Year round offerings of Crooner-Style Jazz Music-perfect for your cocktail party or other special event! 1920s-1960s: we've got it! Curious about something you don't see here? Send us an inquiry! Vintageous Productions is the key to Vintage-Inspired Entertainment in the Austin and Pittsburgh Areas...and beyond! 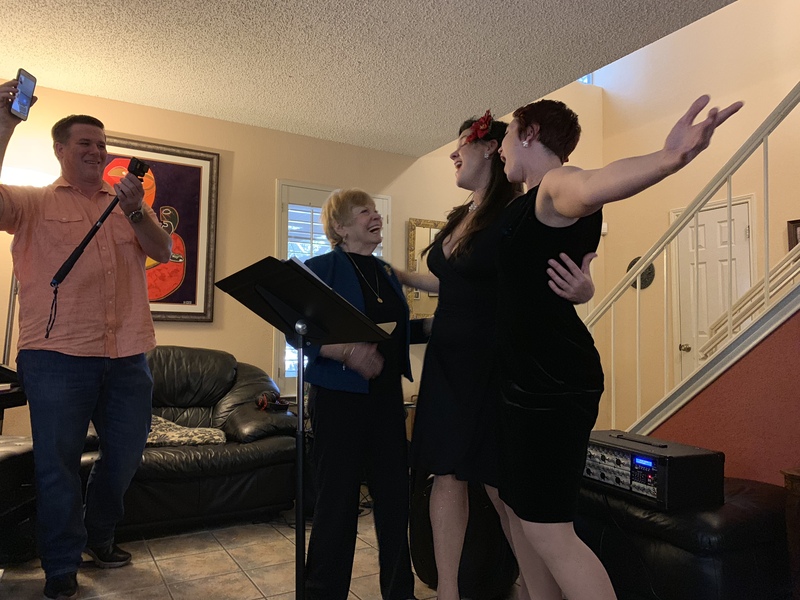 From Jazz to Broadway and Children's Entertainment to Classical, Vintageous has something to make your event extra special and get guests of all ages singing along! Book "Songs For Young Whippersnappers" for a kids' party, Vintageous for a cocktail hour, or a classical vocalist for your wedding! And if you are looking for a classy evening or planning a period-themed event from the 1910's-1960s's, you've come to the right place. Questions? Want to know if we're the right fit? Message us! And here's to an event that's truly VINTAGEOUS! Val Williams created Vintageous Productions in 2015 while living in New York City as a singer and entertainer. Val has been seen as a soloist on stages from New York City to Hawaii and abroad, and is well known for her charismatic personality and the beauty and emotiveness of her voice. 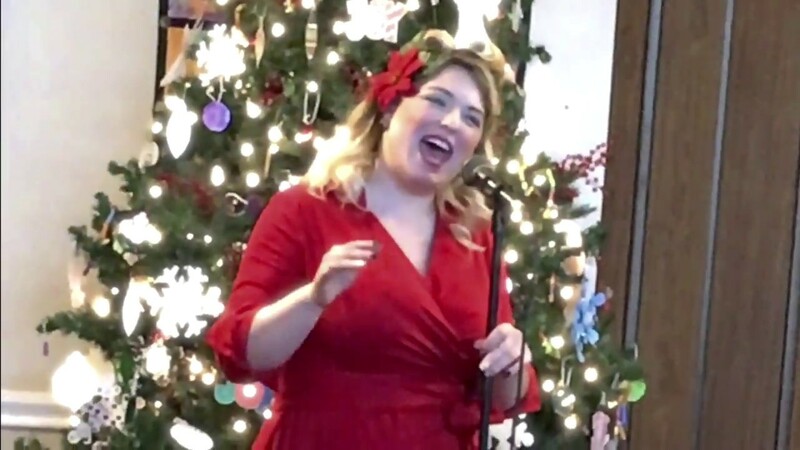 With a background and training that includes classical, jazz, pop, musical theater, and sacred music, Val's diversity of musical knowledge, love of history, and affinity for all things vintage allow her to tailor each performance to perfectly suit the venue and event. She is thrilled to get to work with so many talented performers! Hold Harmless Waiver can be provided upon client request. 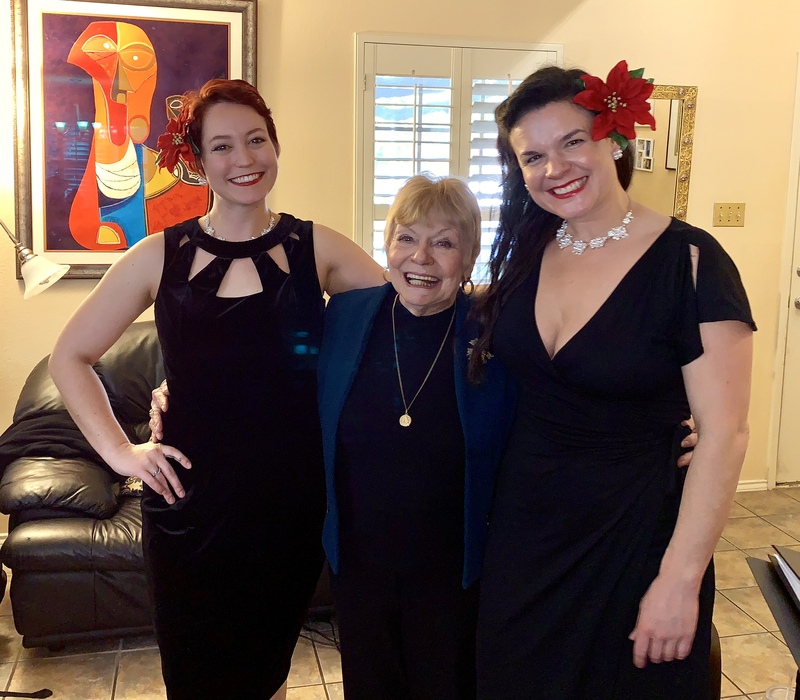 December 06, 2018 • 5:00pm - 6:00pm Dinner Party with "A Very Vintageous Holiday"
Peggy Lee, Rosemary Clooney, Etta James, Nina Simone, Ella Fitzgerald, Duke Ellington, Hoagy Carmichael, Johnny Mercer, Rogers and Hammerstein, George Gershwin.